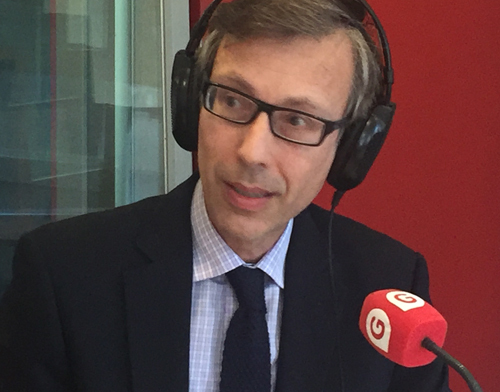 Fantastic interview on international criminal matters of our managing partner, Ernesto Díaz-Bastien, on “El Superviviente”, radioya.es. Here you can find the podcast to the complete interview (Spanish). We are delighted to share with you an interview that the Spanish business newspaper Expansión published a few days ago with our Managing and-Director partner, Mr. Ernest Díaz-Bastien. 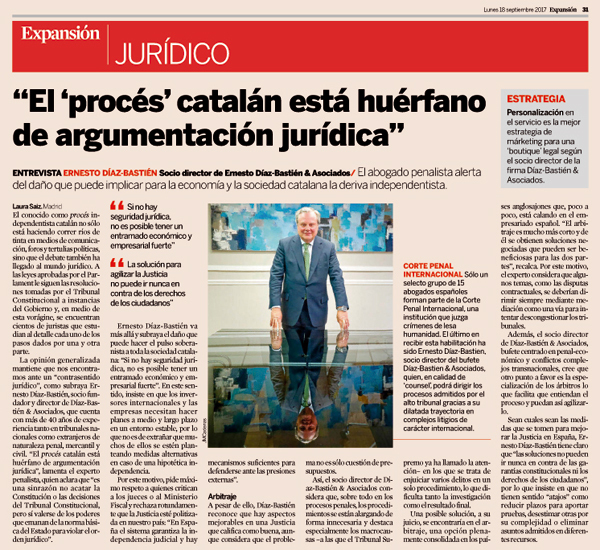 The extensive interview covers Ernesto´s views on the Catalan independency, on arbitration as dispute resolution mechanism and on his appointment as senior -counsel of the International Criminal Court. Ernesto alerts on the possible damage that the independence drift might cause on the Catalan economy and society and he comments on the legal situation created by the Catalan parliament and the reaction of the Constitutional Court of Spain which suspended any attempt to hold a referendum in this circumstances. Mr. Ernesto Díaz-Bastien also underlines that Spanish Judiciary is an – independent institution and there is no political influence on court rulings in Spain. Regarding arbitration as a highly efficient method of dispute resolution method Ernesto clearly favors this option to help Spanish courts in reducing drastically its number and -the extension of domestic court proceedings. 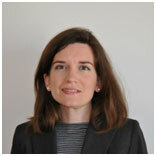 Arbitrators are specialists that understand commercial conflicts and therefore can work more quickly. 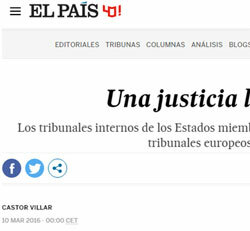 Finally, the article remarks that only fifteen Spanish lawyers are admitted as senior counsels at the International Criminal Court being Mr. Ernesto Diaz-Bastien one of those privileged attorneys that can lead de defense on any proceeding handled by this International high court. Ernesto Díaz-Bastien & Associates celebrates its second anniversary of its new professional, concentrated and independent project. We are very satisfied with the achieved results. This satisfaction we do owe completely to you for your trust, which is our main asset. Trust, which must be reciprocal, is essential for the professional relationships of a lawyer, trust in his clients and to count on the trust deposited by them. Our team is very glad about my recent admission as counsel at the International Criminal Court where I will defend and represent accused and victims in procedures brought to this high court. We are also very delighted with news from London referring to the distinction from Who’s Who Legal which has listed my name among the lawyers specializing in financial and corporate criminal law in Spain. Thank you very much. This judicial year is about to finish with its usual overload of work to which we lawyers are very well accustomed. What I most appreciate is how conscience spreads among citizens that they must be taken precisely as such and defend their right and defend themselves in the face of excess of power, any kind of power. We learned from classical liberal political thinking that those who hold power tend to abuse it. Resisting this excess is the high mission of lawyers who attend courts. We greet them fraternally including all the law firms that have raised their flags to defend the rights of thousands of savings owners and consumers. Spanish lawyers are very much alive and carrying their gowns. While this persists, we will keep our trust in the supremacy of Law. covers the assignment of Ernesto Díaz- Bastien to the International Criminal Court. Castor Villar on Derecho Abierto radio show talks about the new law on contracs with public administrations (05/04/2017). The outcome of the referendum on Great Britain´s remaining in the European Union is a clear signal for European institutions. The fact that one of the important members of the Union has decided to leave is in fact no good news for the European project. It come up with some of the shortcomings the EU maintains with its citizens. We are facing quite special circumstances. In the ruling which we comment on, there the existence of Punishible self-laundering crime has been proofed, committed in order to cover up certain assets of illegal origin, obtained after the same subjects – with different degrees of participation – have performed previously a continuos crime of aggravated misappropriation, which was judged in the same procedure. 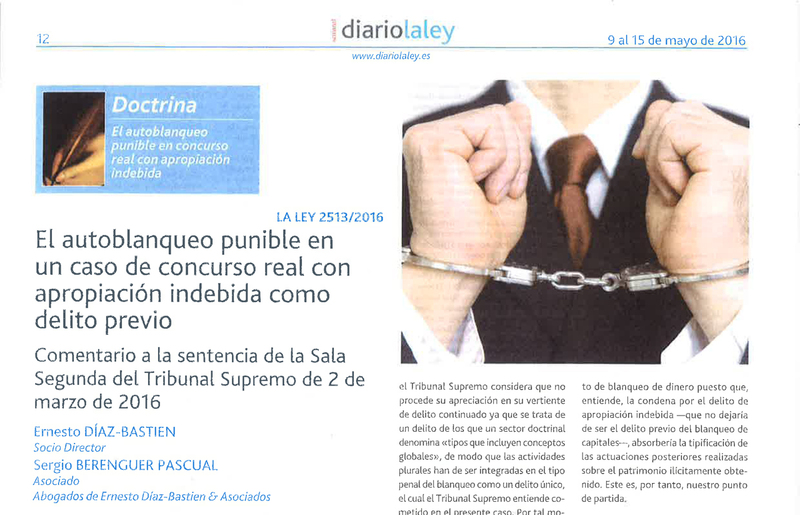 The prestigious economic newspaper Expansión covered the launch of our law firm. Once again, Ernesto Díaz Bastien has been honored as one of the best international criminal investigation lawyers. 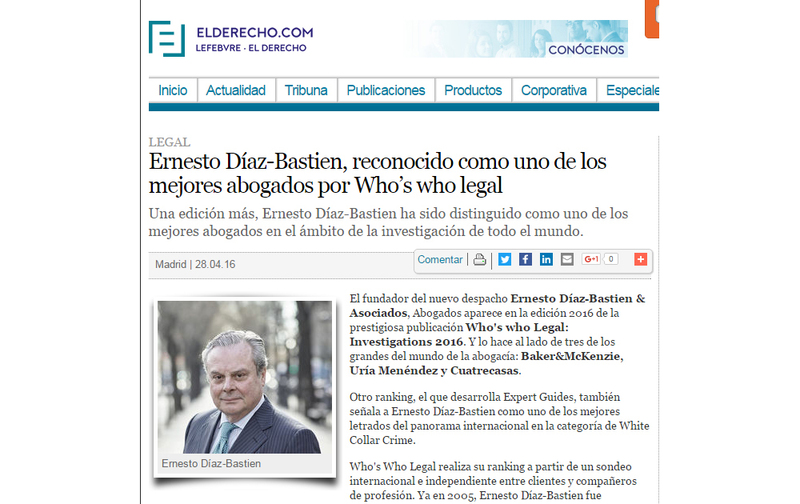 The founder of Ernesto Díaz-Bastien & Asociados has been listed in Who’s Who Legal 2016 edition in its chapter dedicated to investigations. Only four Spanish lawyers from mayor law firms like Baker & McKenzie, Uria Mendez and Cuatrecasas figure in this list. 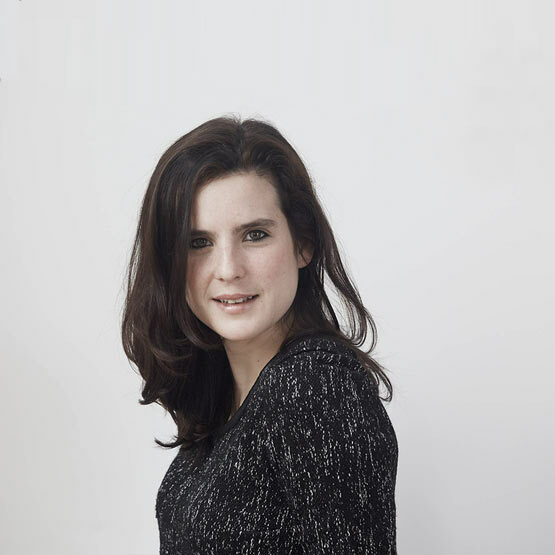 Angela Díaz-Bastien, partner at Ernesto Díaz-Bastien & Asociados, where she leads the Human Rights department, has acted as panellist and moderator a a recent meeting of the International association of Lawyers (UIA) held in Samsun (Turkey) during May 21 and 22. Listen the podcast on the player or following the link este enlace. Listen the podcast on the player or following this link. 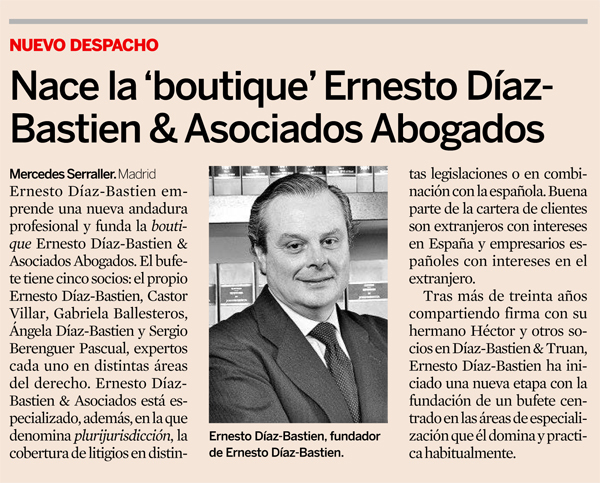 The spanish economic daily newspaper Cinco Días, has interviewed Ernesto Díaz-Bastien, managing partner of Ernesto Díaz-Bastien & Asociados. 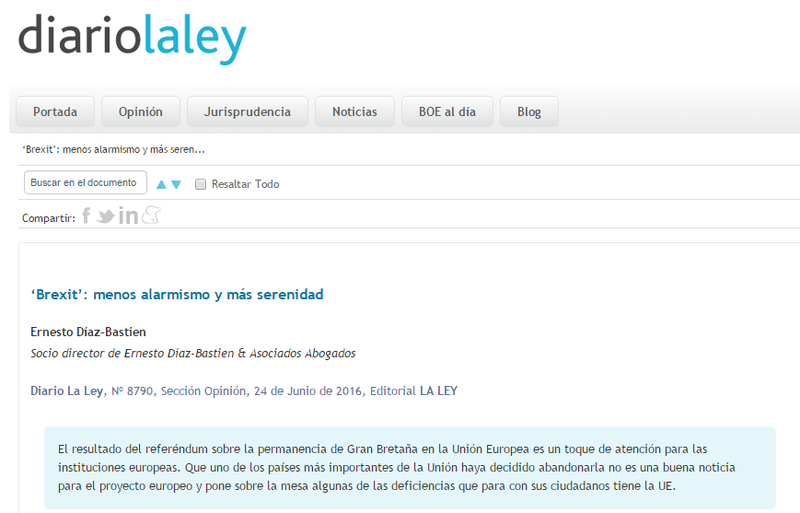 Our senior associate, Gabriela Ballesteros writes in Spanish economic daily Cinco Dias on geo-blocking for e-commerce websites in the EU. Nos encontramos ante un supuesto de hecho muy particular. E n l a sentencia que se comenta se ha determinado la existencia de un delito de autoblanqueo punible cometido con la finalidad de encubrir determinados activos de origen ilícito, obtenidos tras haber realizado con carácter previo -por los mismos sujetos, pero con distintos grados de participación- un delito continuado de apropiación indebida agravada, que también fue juzgado en el mismo procedimiento. Continuar la lectura del artículo “Posible efecto dominó del caso Volkswagen”, de los autores Ernesto Díaz-Bastien & Sergio Berenguer Pascual, en Informativo Jurídico y en Economist & Jurist.